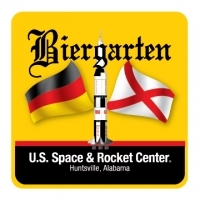 Visit the U.S. Space & Rocket Center Saturn V Hall in the Davidson Center for Space Exploration* every Thursday from 4:30 p.m. - 7:30 p.m. for the German Biergarten, featuring authentic German cuisine crafted by renowned chefs David Oreskovich and Jason Williams. Enjoy the festive atmosphere with imported and domestic beers and delicious wines from the German region. It’s family friendly and leashed dogs are welcome, rain or shine! To support our local community, the U.S. Space & Rocket Center is featuring a nonprofit organization each week, and a portion of food sales that evening will be donated to the organization. On May 14, 2015, join us for WEDC-FOUNDATION Night!